Connect with me at www.andyoliver.me. 51”You stiff-necked people, uncircumcised in heart and ears, you are forever opposing the Holy Spirit, just as your ancestors used to do. 52Which of the prophets did your ancestors not persecute? They killed those who foretold the coming of the Righteous One, and now you have become his betrayers and murderers. 53You are the ones that received the law as ordained by angels, and yet you have not kept it.” 54When they heard these things, they became enraged and ground their teeth at Stephen. 55But filled with the Holy Spirit, he gazed into heaven and saw the glory of God and Jesus standing at the right hand of God. 56“Look,” he said, “I see the heavens opened and the Son of Man standing at the right hand of God!” 57But they covered their ears, and with a loud shout all rushed together against him. 58Then they dragged him out of the city and began to stone him; and the witnesses laid their coats at the feet of a young man named Saul. 59While they were stoning Stephen, he prayed, “Lord Jesus, receive my spirit.” 60Then he knelt down and cried out in a loud voice, “Lord, do not hold this sin against them.” When he had said this, he died. O God, you can’t make this stuff up. 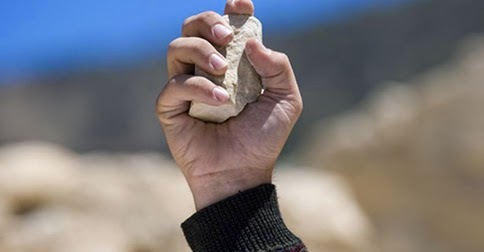 Sunday’s lectionary text is the stoning of Stephen. Tomorrow, another one of your chosen prophets goes before the masses. When Mary Ann sits before the Southwest Texas Board of Ordained Ministry, like Stephen will she find stiff-necks, uncircumcised hearts, and closed ears? Will she encounter prophet persecutors, betrayers, and murderers? O God, fill Mary Ann with your Holy Spirit, just like you did for Stephen. May she too see and feel your presence. We know you transform stones cast in fear into stones that roll away. God, will you once again turn death into life?